Paul Schrader’s Forever Mine is a melodramatic romantic revenge thriller that never truly coalesces into something great, but has elements which work nicely. We get two really great lead performances from Gretchen Mol and Ray Liotta, and one from Joseph Fiennes that isn’t as committed, or maybe it’s just that I’m not a fan of his and always feel that he’s mis-casted. Fiennes is the cabana boy working the beaches who falls in love with Mol, the much younger wife of Liotta’s shady, volatile politician. Jealousy roars into play, violence rears it’s head and tragedy looms when the affair becomes a full blown love triangle. Liotta is a dangerous man with powerful friends and he soon fixes it so the two of them can never see each other again, on top of having him viciously scarred. Flash forward a decade or so, Fiennes has become something of a shady businessman himself, and has returned seeking payback on ol’ angry Liotta. The one giant misstep in the script here is assuming that no one would recognize him simply because he’s become rich, cultured and suave, I mean it’s still the exact same guy in the flesh, Liotta and his ilk seem to buy the ruse, but it just doesn’t sell. It’s all very mirthless and operatic, so much so that it reminds me of Tony Scott’s Revenge which is the ultimate noir soap opera, but it works here and there. Liotta and Mol simmer off the screen but like I said above, Fiennes is just an awkward foot and doesn’t seem to work for me wherever I see him. The film’s strongest point lies in its last sixty seconds or so, when the whole thing wraps up in a melancholic vignette of tandem narration from him and Mol, a beautifully spoken and edited sequence that’s brief but truly affecting, poetic and heartbreaking. A so-so film. 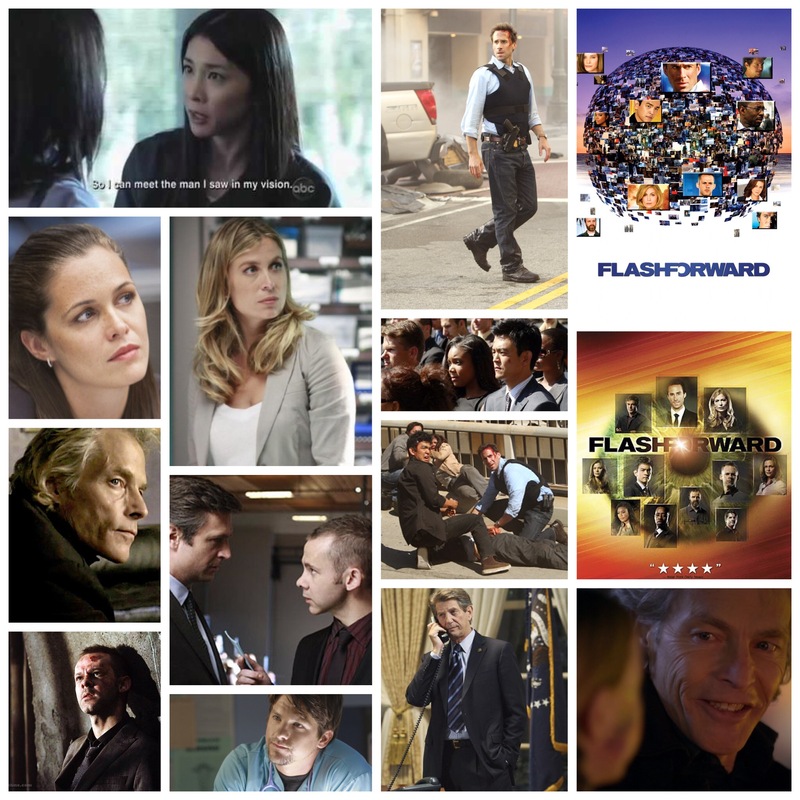 ABC’s Flashforwad was a gripping psychological/supernatural epic with potential to run many seasons and provide us with solid entertainment for a long time a lá Lost (which it bears some similarities with), but the network mysteriously axed it after a single season, leaving a vacuum in the air as far as it’s story, and many viewers left stranded, wanting more. The show was built around a wicked concept: one day, every human being on planet earth simultaneously blacks out for a few minutes, and in that time has a precognitive vision of the future some months away from their present time, then promptly wakes up. This of course causes sheer chaos all over the globe, initially with millions of car crashes, disasters and planes falling out of the sky, and eventually the uncertainty, paranoia and confusion as to just what these flash-forwards are all about, and if it will happen again. An FBI task force spearheaded by the likes of Joseph Fiennes and Courtney B. Vance is commissioned to investigate the matter, and their mission takes them to some truly weird places, both geographically and thematically. There’s strange forces at work with this one, secrets that are kept close to the chest and gradually doled out over the expansive twenty three episode arc, a great length of run that should really be the standard for television. It’s similar to Lost in the sense that every week the mystery deepened as opposed to circling a resolution, clues and questions piled on top of the previous ones without a hint of finality or exposition to light the way, an audience tested, surefire way to keep people from flipping the channels mid episode and a great of garnering new viewers via word of mouth. The trick is to also add rhyme and reason to your bag of mysteries, provide a modicum of answers to keep the frustration just at bay, a formula which this one actually succeeds better at than Lost ever did. The scope and budget here are both enormous, giving new meaning to both the terms ‘globetrotting’ and ‘ensemble piece’, a truly vast attempt at long form storytelling. The cast is eclectic, other leads including John Cho as another hard-nosed Fed, Zachary Knighton as a doctor whose life is perhaps affected most by the incident, and brilliant turns from Jack Davenport, Sonya Walger, Peyton List, Dominic Monaghan, Brian F. O’Byrne and the late Michael Massee as nefarious, shadowy ultra-villain Dyson Frost, who serves as a sort of mcguffin during the first act of the show. Guest arcs included James Remar, Thomas Kretschmann, Rachel Roberts, Gabrielle Union, Shohreh Ahgdashloo, Annabeth Gish, Callum Keith Rennie, James Frain, Peter Coyote as the US President and so many more. The show looks amazing too, a brightly lit, well oiled mystery machine with all sorts of storytelling wizardry including nifty slow motion musical montages, trippy time jumps, non linear what-have-you and all manner of neat stuff. Gone way, way before it’s time, this one is well worth a watch and shouldn’t have been written off so soon. And remember: D. Gibbons is a bad man.